In 1784, Great Britain's Admiral Horatio Nelson sailed to Antigua to create his country's Caribbean base. The island's safe harbors and protective coral reef seemed the perfect spot to hide a fleet. Today, Antigua provides an ideal hideaway for vacationers looking for a sunny holiday in the sun-blessed Caribbean. 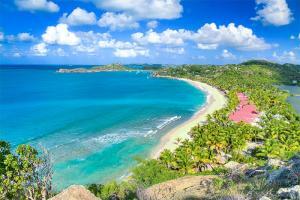 Antigua and Barbuda both comprise the island nation of Antigua. The largest of the English-speaking Leeward Islands, Antigua is 14 miles long and 11 miles wide. Its main harbor is English Harbor in the south, and its tallest point is Mount Obama, which stands 1319 feet high. Formerly called Boggy Peak, the point was renamed for the 44th President of the United States, Barack Obama.. Its sister island, Barbuda, lies about 30 miles north. The tiny country also includes an uninhabited island turned nature preserve called Redona. Antigua's capital and largest city, St. John's, in the northwest, houses pastel-colored buildings, the impressive 17th century Government House, 19th century baroque St. John's Cathedral, a museum and the popular Public Market, and an Arts and Crafts Market selling retail, produce and local creations. Antigua Our 4-Star classification designates those properties with well-appointed, deluxe accommodations, extensive amenities and comprehensive guest services. Expect attention to detail and a warm and hospitable staff ready to cater to your needs. These superb properties offer a truly refined getaway.